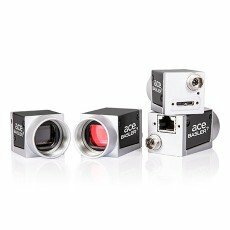 Camera manufacturer Basler presents four new ace U models with the rolling shutter CMOS sensor IMX183 from the Sony Exmor R series. The cameras offer a resolution of 20 megapixels with a sensor size of 1" and a compact design with 29 mm x 29 mm footprint. This combination makes the four new ace U models particularly attractive for inspection of the finest structures, such as in PCB or display production. Constant increases in the resolution of modern displays require ever-higher resolutions in the inspecting camera. The four new high-resolution ace U models feature Basler's PGI feature set for color and monochrome cameras, which corrects unwanted artifacts. This allows users a particularly good image evaluation at the pixel level. Thus, Basler enables detailed inspection of high-resolution displays with excellent image quality at a very attractive price.